Batley Bulldogs slipped to a 32-24 defeat against Swinton Lions, who ended a 16 year wait to record victory at Mount Pleasant. The in-form Lions made a superb start, playing up the Fox’s Biscuits Stadium slope, and raced into an 18-0 win inside the opening quarter. James Brown was penalised for a head high tackle and the Lions launched an attack which saw Stuart Littler send Shaun Robinson in at the corner. Chris Atkin’s touchline conversion went in off a post. Batley responded with a spell of pressure but were repelled by the solid Lions defence and Swinton turned defence into attack when Littler picked up a loose pass and raced 70 metres up the slope only to be caught by Dave Scott. Batley were forced to drop out and Atkin’s kick to the left corner was gathered by Liam Marshall to race in at the corner, with Atkin landing another touchline goal. The outstanding Atkin sent Rhodri Lloyd though a gap and he drew full-back Dave Scott to send Ben White over by the posts. Atkin converted. Former Bulldog Anthony Nicholson was held up close to the posts before Batley finally hit back. Adam Gledhill crossed between the posts and Dominic Brambani added the conversion but Batley were dealt a further blow when winger Wayne Reittie was helped from the field following a nasty clash of heads with Atkin. Batley pressed and had three players held up over the try line and the desperate Lions defence clung onto an 18-6 half-time lead. Vila Halafihi extended Swinton’s lead five minutes into the second half when he crossed from acting half-back and Atkin converted. Batley responded immediately with Gledhill adding his second try, which Brambani improved to get the Bulldogs within 12 points . 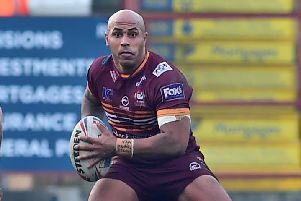 Batley were then given real hope of producing a comeback when Brambani sent full-back Scott over for a try, which the scrum half again improved. Batley attacked again but Atkin picked up a loose ball and kicked downfield for winger Liam Marshall to chase and score in the corner. Brambani launched a 40-20 up the slope but Shaun Ainsough was bundled into touch but soon after Brown sent Scott racing in for his second try and Brambani’s conversion pulled Batley to within four points. However, Swinton clinched a fourth straight victory when Andy Thornley sent Gabriel Fell over for a 72nd minute try.